Queen of France. Born at Vienna, 2 November, 1755; executed in Paris, 16 October, 1793. She was the youngest daughter of Francis I, German Emperor, and of Maria Theresa. The marriage of Louis XVI and Marie Antoinette was one of the last acts of Choiseul's policy (see CHOISEUL); but the Dauphiness from the first shared the unpopularity attaching to the Franco-Austrian alliance. Ambassador Mercy and Abbé de Vermond, the former tutor of the archduchess in Austria and now her reader in France, endeavoured to make her follow the prudent counsels as to her conduct sent by her mother, Maria Theresa, and to enable her thus to overcome all the intrigues of the Court. Marie Antoinette's disdain of Madame du Barry, the mistress of Louis XV, was perhaps, from a political standpoint, a mistake, but it is an honourable evidence of the high character and self-respect of the Dauphiness. Having become queen on 10 May, 1774, she adopted an imprudent course of action, both in her political and private life. In politics she was always so uncompromisingly attached to the Franco-Austrian alliance that she was nicknamed "L'Autrichienne" by Mme Adélaide and the Duc d'Aiguillon's party. Her unpopularity reached a climax when, in 1778, Austria laid claim to the throne of Bavaria and she tried to bring about French mediation between Austria and Prussia. In truth, it was to the interest of France not to permit the indefinite growth of the Prussian power; but the routine diplomats, believing that Austria was to be forever the enemy of France, and the philosophers, who were favourably disposed towards Prussia, as a Protestant nation, abhorred any display of sympathy for Austria. 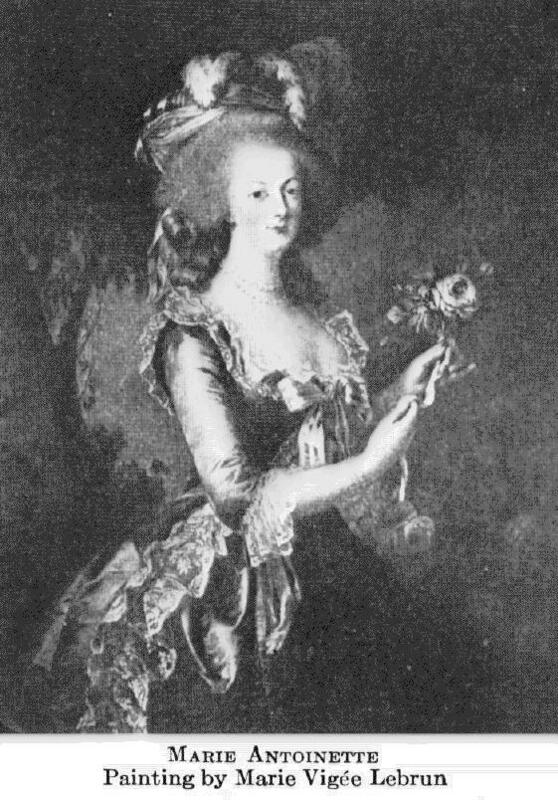 In her private life, Marie Antoinette may justly be blamed for her prodigality, for having, between 1774 and 1777  by certain notorious escapades (sleigh racing, opera balls, hunting in the Bois de Boulogne, gambling) and by her amusements at the Trianon (see VERSAILLES)  given occasion for calumnious reports. But she confessed to Mercy that she indulged in this dissipation to console herself for having no children; and the tales of Besenval, Lauzun, and Soulavie, about the amours of Marie Antoinette, cannot stand against the testimony of the Prince de Ligne: "Her pretended gallantry was never any more than a very deep friendship for one or two individuals, and the ordinary coquetry of a woman, or a queen, trying to please everyone." De Goltz, the Prussian minister, also wrote that though a malicious person might interpret the queen's conduct unfavourably there was nothing in it beyond a desire to please everybody. Besides, the queen continued to give edification by her regular practice of her religious duties. "If I were only a mother, I should be considered a Frenchwoman", wrote Marie Antoinette to Mercy in 1775. She became the mother of Madame Royale in 1778, in 1781 of a Dauphin who was to die eight years later, and of little Louis XVII in 1785. But the ill-feeling towards "L'Autrichienne" was stirred up by the lamentable "Affair of the Diamond Necklace" (1784-86). Cardinal de Rohan, grand aumônier of France, deceived by an adventuress, who called herself Comtesse de la Motte-Valois, purchased for 1,600,000 livres a necklace which he believed the queen wished to have; the lawsuit begun by the unpaid jewellers resulted in the acquittal of Cardinal de Rohan, while the publicity of the allegations of Mme de la Motte, who pretended that the queen was aware of the transaction, and the romantic story of a nocturnal rendezvous at the Tuileries, were exploited by Marie Antoinette's enemies. The Comte d'Artois compromised her by his intimacy, scurrilous pamphlets were circulated, and, particularly in certain court circles, that abominable campaign of mendacity was inaugurated to which the queen fell a victim at a later period. In 1789, at the opening of the States-General, the crowd, acclaiming the queen's enemy, shouted in her hearing: "Long live the Duc d'Orléans!" The events of October, 1789, which forced the Court to return from Versailles to Paris, were directed especially against her. In June, 1791, the projected flight which she had planned with the assistance of Fersen and Bouillé, failed, the royal couple being arrested at Varennes. 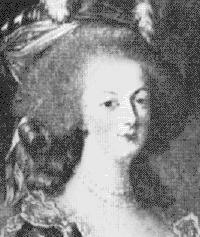 Marie Antoinette secretly negotiated with foreign powers for the king's safety; but when, on 27 August, 1791, Leopold of Austria and Frederick William of Prussia bound themselves, by the Declaration of Pillnitz, never to allow the new French Constitution to be established, she wrote to Mercy that "each one is at liberty to adopt in his own country the domestic laws that please him", and she regretted the extravagances of the émigrés. She wished the powers to hold a kind of "armed congress" which, without making war on France, should give moral support to the French king, and inspire the better class of his subjects with courage to rally round him. But the Revolution was hastening: on 13 August, 1792, Marie Antoinette was shut up in the Temple; on 1 August, 1793, she was sent to the Conciergerie; her trial took place on 14 October. Accused by Fouquier-Tinville of having tried to foment both war with foreign nations and civil war, the "Widow Capet" was defended by Chauveau-Lagarde and Tronson Ducoudray, who were forthwith cast into prison. She may have received absolution from the Curé of Ste-Marguerite, who was in a cell opposite to hers; at all events, she refused to make her confession to the Abbé Girard, a "constitutional" priest, who offered her his services. She mounted the scaffold undauntedly. Her historian, M. de la Rocheterie, says of her: "She was not a guilty woman, neither was she a saint; she was an upright, charming woman, a little frivolous, somewhat impulsive, but always pure; she was a queen, at times ardent in her fancies for her favourites and thoughtless in her policy, but proud and full of energy; a thorough woman in her winsome ways and tenderness of heart, until she became a martyr." DE BEAUCOURT AND DE LA ROCHETERIE, eds., Lettres de Marie-Antoinette (2 vols., Paris, 1895, 1896) (the only edition to oonsult, since Geffroy has convicted Feuillet de Conches' earlier publication of inaccuracies and interpolations); ARNETH AND GEFFROY, eds., Correspondance secrète entre Marie-Thérèse et Mercy Argenteau (Paris, 1874); ARNETH ET FLAMMERMONT, eds., Correspondance de Joseph II avec le prince de Kaunitz (Paris, 1889-91); ARNETH, ed., Marie-Antoinette, Joseph II, und Leopold II., ihr Briefwechsel (Leipzig, 1866); IDEM, ed., Maria-Theresia und Marie-Antoinette, ihr Briefwcehsel (Leipzig, 1866); DE LA ROCHETERIE, Histoire de Marie-Antoinette (Paris, 1908); DE NOLHAC, La reine Marie-Antoinette (Paris, 1898); IDEM, Marie Antoinette, the Dauphine, tr. from the French (folio, Paris, 1897); IDEM, Versailles au temps de Marie-Antoinette (Paris, 1892); DE SÉGUR, Au couchant de la monarchie (Paris, 1910); BICKNELL, The Story of Marie Antoinette (London, 1897); BLENNERHASSETT, Marie-Antoinette Königin von Frankreich (Bielefeld, 1903); BOUTRY, Autour de Marie-Antoinette (Paris, 1907); FUNCK-BRENTANO, L'affaire du collier (Paris. 1901); IDEM, La mont de la reine (Paris, 1902).  An excellent study of the historical sources on Marie-Antoinette is TOURNEUX, Marie-Antoinette devant l'histoire. Essai bibliographique (2nd ed., Paris, 1901). MLA citation. Goyau, Georges. "Marie Antoinette." The Catholic Encyclopedia. Vol. 9. New York: Robert Appleton Company, 1910. <http://www.newadvent.org/cathen/09665a.htm>.